Includes raffle ticket to win door prizes when you purchase ticket and sign up for the email/snail mail MidSummer Bluegrass Newsletter which comes out in early December to give Season Greetings and tell news of next year's Bluegrass Show. Includes festival entry each day and free carry-in camping (must register at gate to camp on grounds). In order to reserve, Purchase of an All Access Pass or a full Friday or Saturday Pass is required, in addition to the Car Camping $20 weekend fee (subject to assigned car camp site availability and must register at gate before you camp). In order to reserve, Purchase of an All Access Pass or a full Friday or Saturday Pass is required, in addition to the RV or Trailer Camping $40 weekend fee (subject to assigned RV or Trailer Camping camp site availability and must register at gate before you camp). All campsites are rustic with no hook-ups or electricity. Check out our Lodging page for other local accommodations. If you have any questions about purchasing tickets or camping, please email us. As a condition for entering the grounds, all individuals give permission for their images to be used in photos, film and audio recordings at any future time, without monetary compensation, and by the discretion of the Midsummer Bluegrass Music Festival. Tickets must be presented at gate. 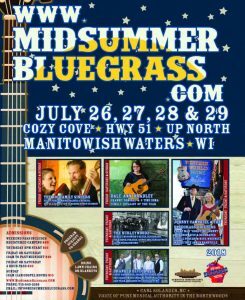 Midsummer Bluegrass is a rain or shine activity. Refunds will not be given for inclement weather. Any ticket holder wishing to purchase alcoholic beverages must be at least 21 years of age at the time of the festival, and must present a valid driver's license or ID at the gate.